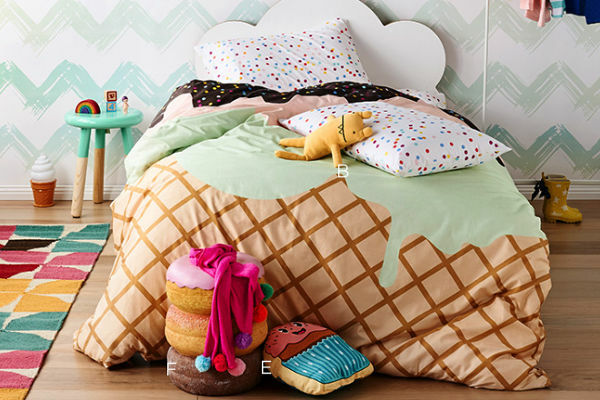 Hungry for kids’ decor that’s fun? We’ve hit the refresh button on some of our tastiest looking past Babyology finds, click on through to reveal the scrumptious buffet! I’m an ice cream enthusiast and my three kids are equally passionate about doughnuts, so the Sack Me range of linen is positively feast worthy. 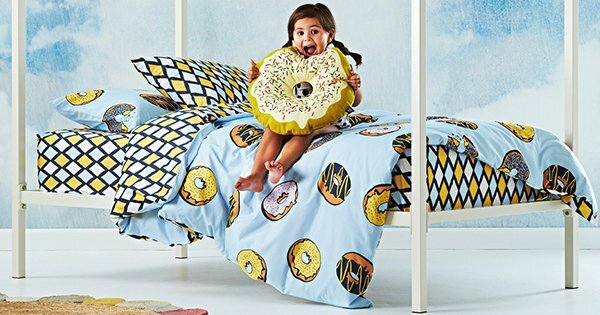 Be quick to nab the Limited Edition Sunday Sundae linen and check out their awesome new Krispy Dream (pictured top) quilt cover, pillowcase and cushion! 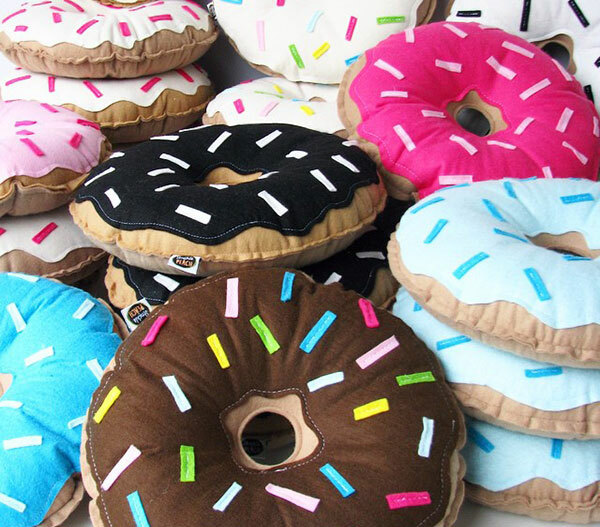 It’s positively raining doughnuts in every flavour at Struckla and Peach from classic chocolate to strawberry with sprinkles – these beautiful Donut cushions always sell out fast, but there are a few flavours left, so hot foot it over there to nab one (or two if hungry!). It’s one thing to snuggle up in ice cream sheets or even lay your head on a doughnut, but the darling folk at Love Mae make it possible to stick the sweetest of mini watermelon wedges to your walls – and Watermelon Dreams wall decals being this cute and dainty, why wouldn’t you?! When is the perfect time for ice cream? 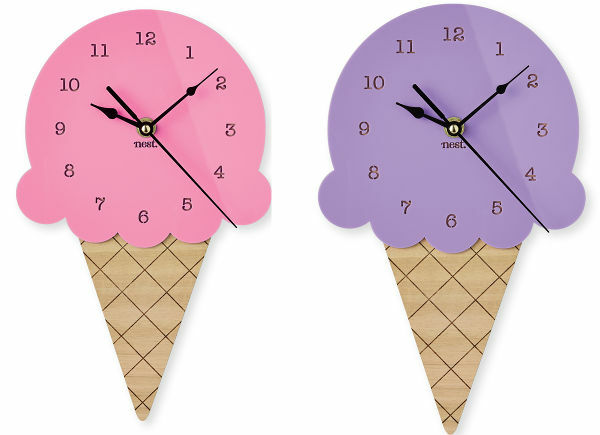 Nest Accessories can help you keep an eye on the time with these Ice Cream Wall Clocks. It’s behind this virtual door that you can also find pineapple, watermelon and ice cream mirrors – just to really sweeten up a bedroom or playroom wall. No need to sneak out of bed for a sugar laden midnight snack when you can sleep in a Bed Toppings chocolate bar and not have to move a muscle. 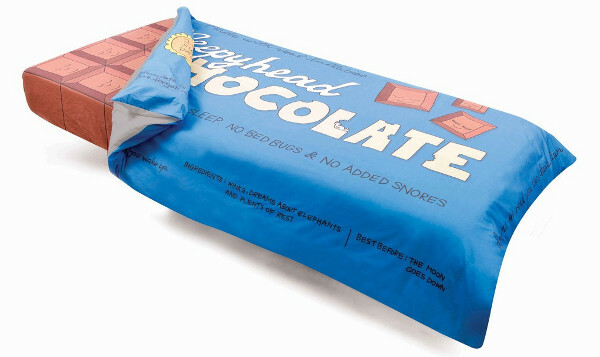 Nestled in between chocolate pieces and a crisp wrapper, surely this makes for the sweetest of dreams? It’s not all about the sweets though for this round up – we’ve shared our fair share of savoury items too. Have a friend that loves nothing more than a Japanese banquet? 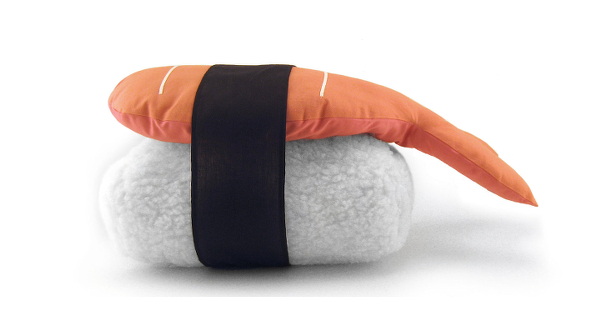 Maybe they’d love to add a sushi pillow to their couch, and like any good restaurant, Etsy’s Stella n Charlie also offer a vegetarian option by way of jumbo edamame pillows. Perfect! Doll houses didn’t miss out on an edible makeover either with these timber morsels of delight from Rock and Pebble. 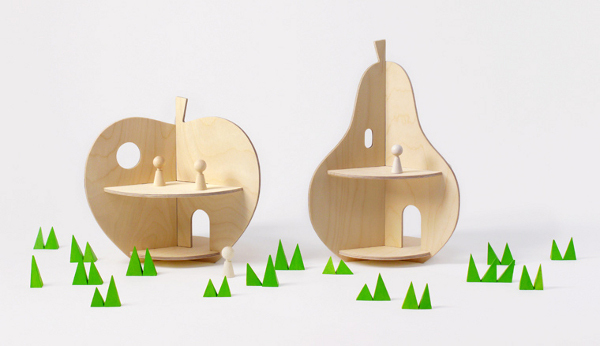 Perfect for dolls, farm animals, Lego mini-figurines and trinkets – whichever treasured toy it is that needs a home, it can definitely be made in an Apple or Pear House. 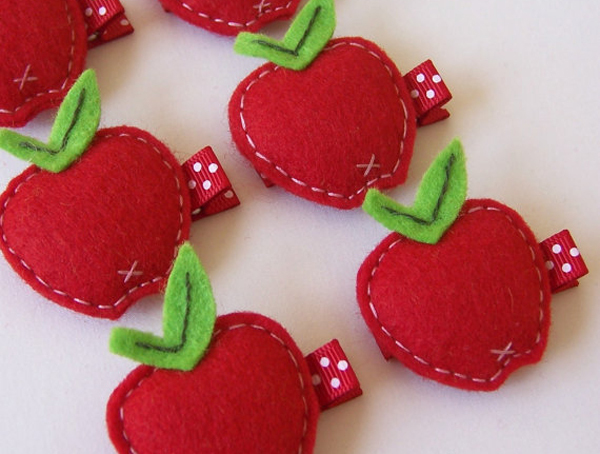 A fruit salad of felt hair accessories await with this Etsy find of ours – it’s apples, peaches, strawberries, cherries, watermelon (even gumball) hair clips galore, all too irresistibly cute to ignore. Find them all at Etsy’s Masterpieces Of Fun Art. Learning about good, healthy food is important and what better time to start teaching children this than right from the very start? 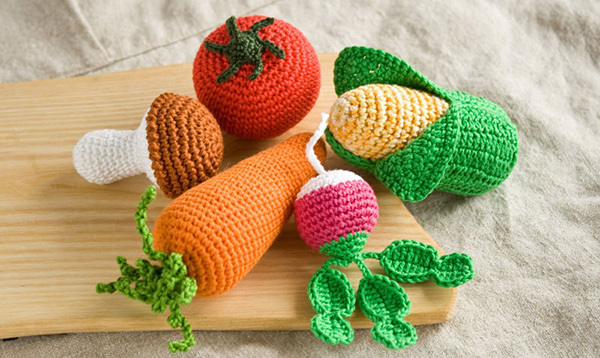 You can get all your daily fruit and vegetables requirements in cotton crocheted baby rattle form, from Freja Toys. Finally, the jury is out on if you can lay straight in it or if you have to find an onion ring position, but fancy being the extra special ingredient sleeping in this hamburger bed above! 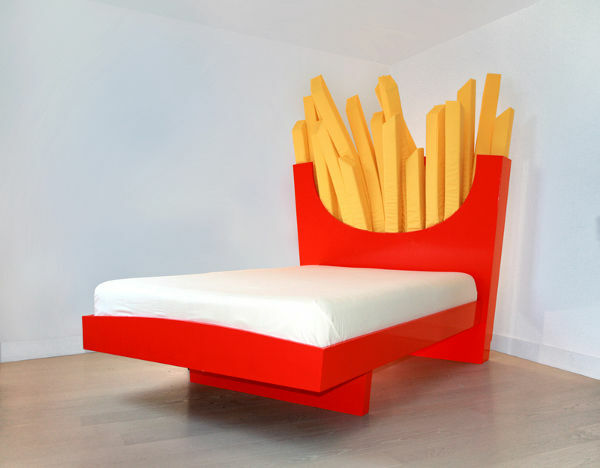 Or how about making it a matching burger and fries set in a shared room with the Supersize Bed (below).